We are a leading Manufacturer of 0.5 hp self priming pumps and solar pumps from Ahmedabad, India. We are manufacturing 0.5 hp self priming in CI Body. - delivery size 12.5 x 12.5 suction 6mtr. total head 28 mtr. 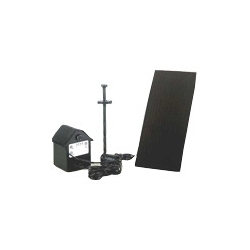 Conceding to the demands of our clients, we come with Solar Pumps at customers' premises. Along with this, the offered range of solar pumps is suitably checked on different characteristics to ensure its compliance with the industry laid norms and standards. The offered range of solar pumps is sourced from reliable vendors, who ensure to made it utilizing high grade raw material and modern machines. Looking for 0.5 Hp Self Priming Pumps ?